The Vortex Pro Internal Combi oil boiler is a floor standing unit that includes a variety of features and benefits. This boiler is a condensing unit that has been designed by Grant to supply hot water and heating on demand by directly via the mains water supply. This means you don't need to have bulky tanks or a hot water cylinder making it perfect for smaller homes where space is limited. 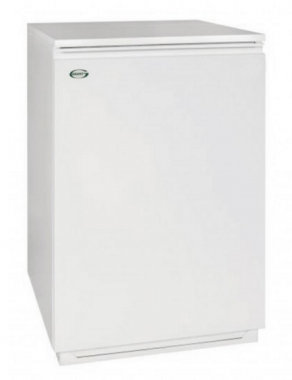 This highly reliable unit has an efficiency rating of 90.8% making it A rated. It has an output of 21kW which is perfect for smaller properties without a high demand for heating or hot water. Key features include a 24 litre expansion vessel and a high efficiency circulating pump. It is simple and quick to install with no complicated wiring or plumbing helping to save you both time and money on installation. It also features the unique Vortex stainless steel heat exchanger and a Riello RDB burner with plug and socket connections. The 4 litre expansion vessel which is normally located behind the front door of the boiler is supplied as an externally fitted vessel kit. This boiler is compact in size helping to save you space in your home and is available in outputs of 21kW, 26kW, 26kW XS and 36kW ensuring there is a unit to suit you and your home need for heating and hot water. This highly reliable unit has been awarded Which? Best buy and includes a 2 year warranty as standard.